severus snape. severus snape. HD Wallpaper and background images in the severus snape club tagged: severus snape harry potter severus potions master alan rickman proffesor deathly hallows 2 snape. I am so in love with this photo!!! Where did you get these ?! Great pic ! Very touching way of seeing the scene - I'm sure they had filmed it from another point of view. Very intense in photo. 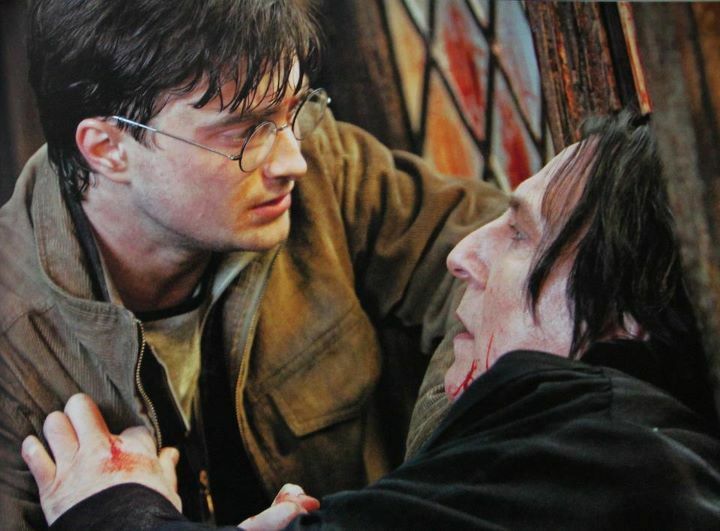 By chance, as I type these words, I'm listening to the Requiem by Gabriel Fauré, with the part entitled "Libera Me" - exactly the feeling that I have when watching Severus in that pic. Pretty soon, he's going to be free forever. yeah where is this from?? Are there any more??? They look like They Love Each other in this picture! so I want more pictures !!!!! Is there more? OMG! All his blood...that makes me cry again. On the other hand it was the only moment in all of the movies when I had deep respect for Harry. Touching! I'm not a big fan of him, cause of all the things he said to his professor; but this moment shows another side of Harry, a side, I've never seen before. Thanks for that pic!!! Love this pic its so intense makes me want to cry looking at it. The way there both looking into each others eyes and holding onto each other i really think Harry feels something for him here. Someone, somewhere will soon make a photomanip and exchange Harry with Hermione! I know, I spent countless times explaining to my nonreading friends and families that 'no, Snape is not Harry's dad'.